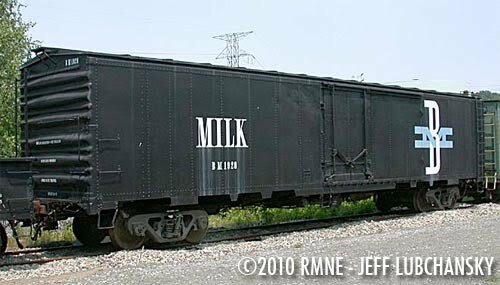 These two cars were the last milk cars built for service in the United States, constructed in 1957-1958 for the Boston & Maine railroad. 1910 was equipped with mechanical refrigeration, for transporting processed milk in one-gallon glass bottles from Bellows Falls Creamery in Vermont to Boston (the Creamery owned the refrigeration units carried by the cars). 1920 was designed for handling “raw” milk in the classic tall 40-quart cans, with crushed ice spread over the load. Both cars last were used for milk service about 1965, and wound up as company storage cars. Both were purchased from B&M in 1989. They look like low steel boxcars, but are equipped with passenger-style trucks, brake systems, couplers, and through steam heat lines. 1920 was restored in 1992, with the interior set up for display and exhibit space. Currently B&M 1920 is on display at Thomaston Station on the Naugatuck Railroad, while B&M 1910 awaits safe movement to RMNE.